Triple pinch pleats and Goblet headings have been popular as an alternative to the very decorative treatments such as Swags and Tails or Shaped Box Pelmets for quite some time now. The depth of the heading detail can be finished in various sizes, it all depends on the depth of the buckrum, but make sure that you do not choose the deep option if your ceiling or windows are low as it will visually alter the height of the room, making it feel rather small and oppressive. 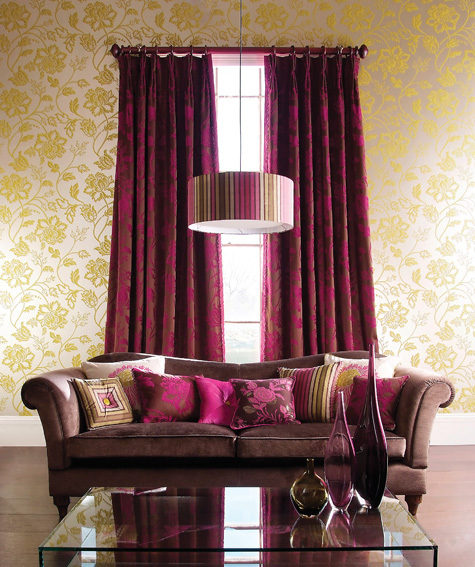 These fabulous triple pleat damask curtains are made from a Harlequin fabric. They do not need to be interlined as the design detailing is already raised making the fabric too thick to be then able to be made into the pleats. The pinch pleat and goblet curtains hang slightly below the pole so that when the curtains are open the heading will have plenty of space to fold back on itself. This leaves the decorative detail neatly arranged together along the front of the curtains when they are open. With this in mind, make sure that your curtain pole is up to the mark as it will be almost entirely exposed. The Regency reeded curtain pole is very economically priced bearing in mind the design detailing and gilt finish. Wooden curtain poles are often more associated with a formal window finish, although there are many metal poles especially brass curtain poles that have a traditionl feel about them. The Swish Minster brass curtain pole is available in three three stylish colours, although the brass colourway is more apt for a formal classic finish such as would have been favoured by the illustrious look of the Victorian and Regency era. Silk is inherently glamorous and cannot fail to bring beauty to any window. 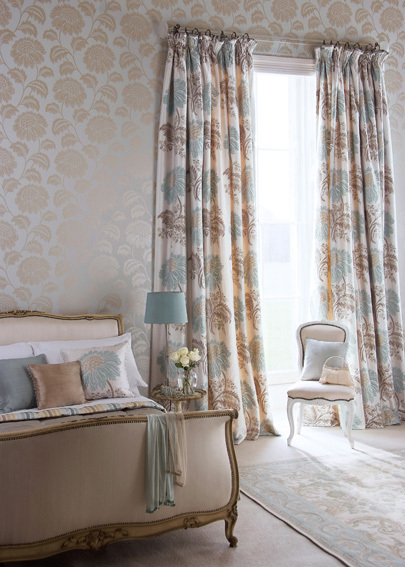 Silk curtains make up particularly well when interlined and finished with a formal curtain heading. The romantic appeal of silk makes it particularly fitting for a Master Bedroom, looking equally attractive when made up into matching bedspreads and cushions. These fabulous silk goblet curtains have been interlined to give body to the fine silk fabric. The shimmering cascade of fabric in a soothing yet refined turquoise pattern is the epitome of luxury and an equally delicate curtain pole such as the Integra Woodworks curtain pole would make a perfect combination. Including a Roman Blind in the window treatment will give you maximum choice for light and privacy. If you want to exclude light completely from the room, perhaps in a bedroom, then certain Roman Blinds such as the Bellini Cream roman blind will do just that whilst blending effortlessly with the rest of the window decor. 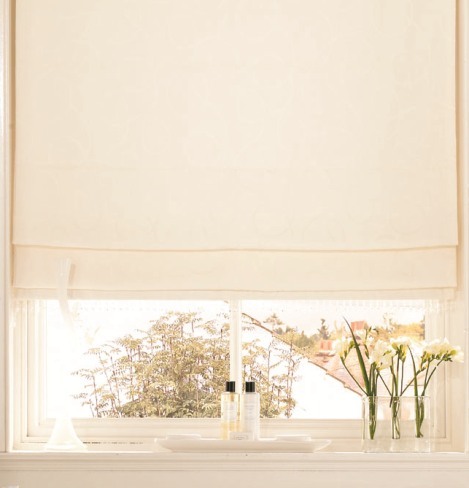 Whilst there are many types of blinds available, the Roman Blind is best suited for the classic window. They are opened by soft layers of fabric folding over eachother giving a more elegant finish than the more contemporary look of perhaps a Roller blind. Blue is great as the lead colour in a bedroom but should be accompanied by a light colour such as cream or shades of off-white. Period looking furniture often looks best in a blue bedroom as it suits the peaceful and relaxed atmosphere. Blackout blinds may be a requirement in a bedroom situation to block the early morning daylight. The mid blue Costello blackout roller blind will blend with most blue decors but as bedrooms are normally more feminine in their finish, you may well wish to also twin the blind with curtains. The other option is to line your curtains with blackout lining. This is also very effective, but you will need a curtain pole or track that is suitable for heavy weight curtains as blackout curtains will weigh significantly more than conventional curtains. The window finish achieved with by fitting a double curtain pole always looks special in a bedroom and the concept meets most people’s requirements for a bedroom window treatment. The first pair of curtains are normally light weight sheers or voiles for privacy during the day and adds a touch of romance. The main curtains hang from the front pole and are used at night. The Integra Options curtain pole has it all. Great design, practicality and looks good. It can be used as a double curtain pole or a standard straight window pole. It is also extendable, making it that little bit easier to fit if the measurements do not completely coincide with your window size. Need an EYELET CURTAIN POLE for your eyelet curtains?. This is a curtain pole that does not have curtain rings as the eyelets in the curtains are the means of fixing the curtains to the pole, the metal pole should match the metal eyelet finish. Eyelet curtain headings, although very modern in style brings about a rather formal finish as the curtains fold back and forth across the pole. The wall fixing brackets are adjustable to suit the size of the fold of the curtain and the finials are hand blown making for their own unique finish. Need a MODERN METAL CURTAIN POLE to set the pace for a contemporary window treatment? The architectural styling of this stainless steel effect or spun brass curtain pole makes a stunning feature of your windows, at a very realistic price. The sharp graphic pattern created by the series of rings on the barrel curtain finial creates a bold modern statement. The circular design of the wall fixing brackets keeps the finish of the pole neat yet trendy, ideal even for the most contemporary of interior designs. Another stylish detail of the Rolls Neo Curtain Pole is the square cut nylon lined curtain rings, creating an air of sophistication by adding an extra design dimension, becoming a complimentary partner to the curtain pole finial. Or traditional pinch pleat curtains dressed on a fabulous hand finished wooden curtain pole such as the Resina Advent Leaf & Berry pole?. The tulip inspired curtain finial is richly adorned with carved detailing which looks particularly outstanding with the finishing touches picked out in silver or gold. The dark wood and gold finishes look stunning in an intimate dining room, or in an elegant yet formal lounge which is richly furnished in bold colours and elaborate curtain headings, deep triple pinch pleats linked with a matching bullion cord for example. The soft antique paint effects are perhaps more suitable for a romantic yet stylish bedroom with the curtain pole lavishly swathed in generous quantities of silks or taffeta, the curtains interlined perhaps with an attached goblet valance finished with a matching bullion fringe and left to hang loosely to the floor, maybe even leaving the curtains puddled onto the floor. Are you overlooked and need a DOUBLE CURTAIN POLE or just an elegant effect for your bedroom windows?. Are your windows overlooked or have an undesirable view – then perhaps they will require a double pole, the Integra Lexington Ball double curtain pole for example, will enable a pair of voile curtains to remain closed during the day with the main curtains only being used at night. This curtain pole is also extendable making it extra easy to fit. Do you have a bay window and need a BAY WINDOW CURTAIN POLE – don’t panic! We have a large range of curtain poles that can be bent by hand, fitted with corner joints to turn the bend or that can be bent at the factory to suit your particular angle.